Racing’s first top-tier women-only racing category, the W Series, has continued to truck right along as it approaches its on-track debut in May. While the selection process has begun—to be continued later this month—the series hadn’t yet released what their cars would look like. Until today. And I hate that I love them. The car, the Tatuus T-318 from the Italian company that has designed feeder series open-wheel cars has been outfitted in a pretty standard livery across the board. 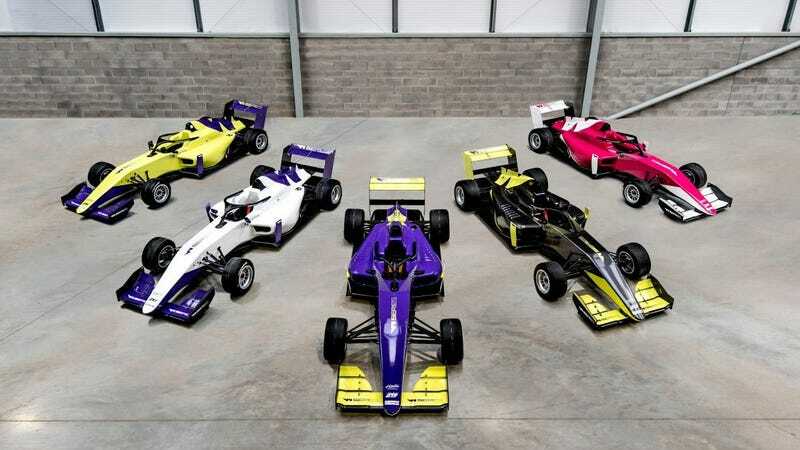 Five different liveries have been designed with different combinations of the pink, purple, green, and yellow W Series logo, featuring a prominent ‘W’ on the rear fin. The dots on the side and the color contrast are both great touches. They’re pretty simple, but they’re classy. The liveries may be standardized, but I’m glad there’s going to be some variety. And I’m always glad to see pink, purple, and green cars. That simplicity is designed to allow “space for prominent for the future positioning of the driver’s name and national flag, as well as her own race number, as specifically chosen by each driver, once the final grid has been finalised,” as per the W Series press release. A clean livery is a nice way to ensure driver visibility. I, like many other race fans, am not comfortable with the whole concept of segregating women out of racing overall in a sport where body morphology doesn’t matter. It feels like an easy way to cordon off all those pesky women demanding track time so that the men can race without having to worry about it. At the same time, though, it’s a great opportunity for women to actually get the track experience they’ve been lacking. No matter what our feelings, the series is going forward. The first day of the final test is March 23, with the final results of the eighteen-driver grid being announced in full on March 28.